Trust in the U.S. regulatory framework designed to safeguard food, beverage and supplement industry safety affords consumers the ability to shop with a healthy assumption of product quality. Behind the scenes, oversight is upheld by ingredient suppliers, regulatory agencies and manufacturers who observe the tenets of Good Manufacturing Practices (GMPs) to ensure the quality and validity of their products at multiple touch points along the supply chain. Affirming quality and validating ingredient efficacy and purity is no easy task but it is necessary to preserve product safety. Because when the unthinkable happens, the specter of doubt targets the commitment of the industry as a whole. 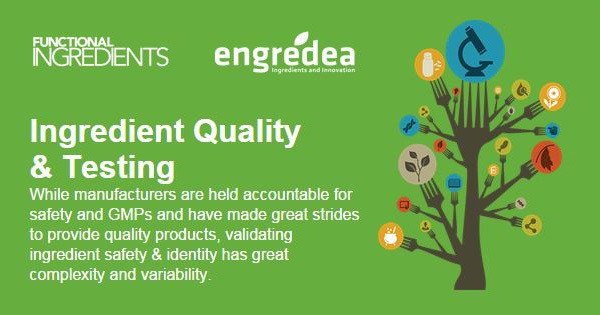 Fill out the form below to access this all-encompassing guide on Ingredient Quality and Testing.